If you are looking at other lift/transfer pumps & they don't have "Cummins ABFJV - Made in China" cast into them, then they are not Genuine Cummins & are just one of many cheap knock off out there. Yes, Cummins has been making their lift/transfer pumps in their 50% owned China plant for years now. Better throttle response & built for performance. 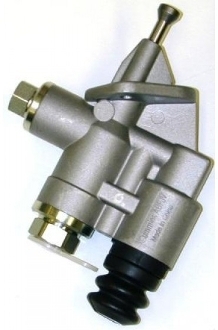 Our pump provides more fuel volume, which will support larger injectors and inj pump mods. By maintaining better feed pressure to your P7100 injection pump, your static injection timing won't fall off from fuel retarding, caused by low fuel pressure/flow. Note : A new lift pump will not fix either a simple air in fuel or drain back problem or a weak or faulty overflow valve. Please don't waste my time if you refuse to fix an existing problem or one the is caused by disturbing old hosesor lines.